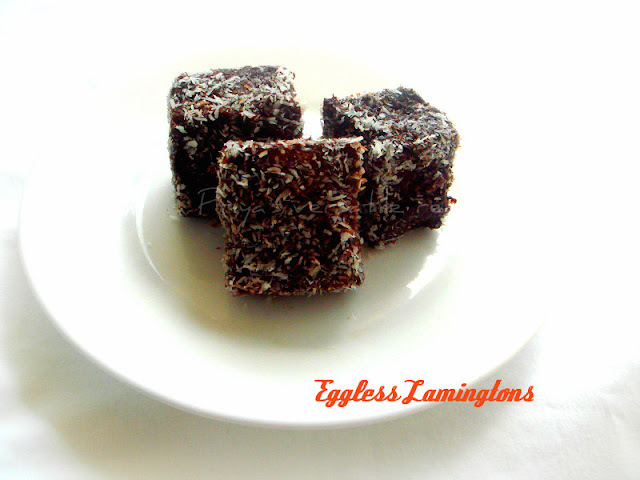 A lamington is a sponge cake of Australia,this cube shaped sponge cake are coated traditionally with chocolate icing and then with dessicated coconut. These lamingtons are in my to do list since a long, thank god Gayathri choosed these famous Australian lamingtons for this month's baking eggless challenge. Finally i made these super addictive cute lamingtons at home, thanks Gayathri for this lovely choice. As this challenge goes for baking eggless, i went for a eggless condensed milk sponge vanilla cake and this eggless sponge cake turned out extremely spongy and truly soft. Later i quickly prepared a dark chocolate icing for the coating and rolled them over dessicated coconut twice for the final touch.My lil one just enjoyed having this addictive lamingtons and for my surprise they vanished very much quickly obviously i went for making second batch of these lamingtons again. Preheat the oven to 350F, line a baking sheet over a square mould. Beat together the butter and sugar until they turns creamy. Add the sweetened condensed milk,vanilla essence,milk to it and beat again until the mixture turns soft. Meanwhile sift the flour with baking soda and baking powder. Now add the dry ingredients to the wet ingredients ,mix with a spatula until everything get well mixed,dont overmix. Pour the cake batter to the already prepared mould and bake in middle rack for 20-25minutes until a skewer inserted comes out clean. Keep aside and let the cake gets completely cool. Cut the into two rectangles first and keep aside. Make a chocolate icing by melting together the chocolate chips,butter,milk and sugar in a microwave safe bowl for 3-4minutes, mix it well. Now add the unsweetened cocoa powder to the icing and mix well again. Spread generously the chocolate icing over one layer of the eggless sponge cake and then top with another layer of the cake. Cut the cake as medium sized squares as u desire. Now whisk the boiling water to the already prepared icing and mix well. With your fingers dip the lamingtons in the chocolate icing and roll them immediately to the dessicated coconut until the lamingtons gets well coated on all sides, roll again the lamingtons to the dessicated coconut twice for a beautiful coating. Let them sit on a wire cooling rack until the chocolate icing gets firms. Enjoy with a cup of hot tea. Sorry friends, i couldnt able to be much active for past a week.Actually i was in holiday mood and thats why i wasnt able to post quite often in my space and also i wasnt able to visit all ur spaces.Again am leaving to Brussels for a week and we are very much excited to visit this beautifuly city. We came back home after a week of vacation yesterday, as i dont want to miss the Olympic games opening ceremony.Oh god it was amazing and just loved the marvellous ceremony, wish France and India will come back with loads of medals, fingers crossed. Coming to this fantastic spicy pizza, i quickly prepared this pizza yesterday for our dinner. If you are searching for an easy breezy pizza, this pizza is for you.I didnt used tomato sauce as we usually go for pizza and spiced the veggies and paneer cubes with a super flavourful spice powder, prepared with garam masala,chilly and few dry herbs. This pizza tastes simply awesome,definitely healthy and really prefect for a dinner.Sending to Dish It Out-Tofu/Paneer and Bellpepper guest hosted by Usha,event by Vardhini and to VFAM-Zucchini guest hosted by Vardhini,event by Priya. Mix the active dry yeast to a luke warm water and keep aside. Combine flour and salt in a bowl,drizzle in olive oil until combined with flour. Next, pour in yeast-water mixture and mix until just combined. Coat a separate mixing bowl with olive oil, and form the dough into a ball. Coat the dough with olive oil, then cover the bowl tightly with plastic wrap and store in the fridge until you need it. Mix the garam masala powder,chilly powder,salt,dry oregano,dry parsley leaves together and keep aside. Take enough pizza dough,roll it as large or medium sized circular disc.Transfer the rolled pizza dough to a baking sheet placed over a baking tray. In a large bowl,take the sliced zucchini,chopped tomato,cubed paneer,cubed bellpepper and add the spice powder,olive oil. Mix gently until the veggies & paneer gets well coated. 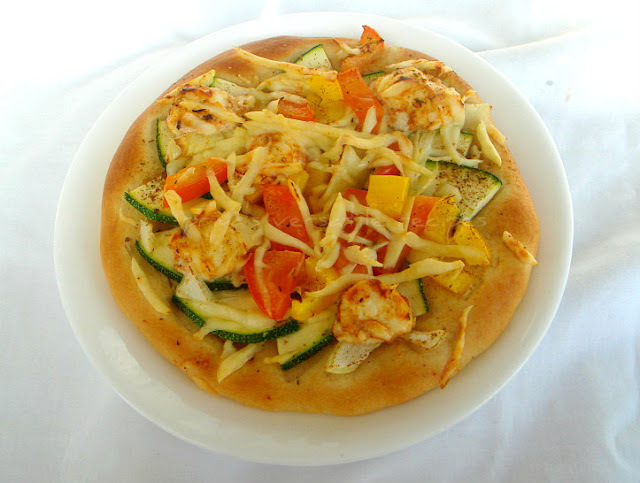 Preheat the oven to 400F..Arrange the spice coated veggies and paneer cubes as you desire over the rolled pizza dough. Springle the grated cheese over the arrange veggies and bake for 20-25minutes until the crust turns brown. Baking a homemade bread, cake or cookies will give the best outcome. However in order to achieve the best results, a perfect recipe and right techniques are required. We are a small group of home baker friends, Reeni (Cinnamon Spice and Everything Nice) , Julie (Erivum Puliyum) Tina (Pinay In Texas Cooking Corner ) , Priya (Priya's Versatile Recipes) , Suja (Kitchen Corner -Try It),Archana (Tangy Minds), Prathibha (Cook Ezee), Reshmi (Easy Cook) and Swathi ( Zesty South Indian Kitchen) who love and want to learn more about the nook and corners of baking. We are planning to try out recipes from books/magazines and cooking shows. Every member gets a chance to present their choice of recipe and share important points with the rest of the group. Main purpose of this group is to learn the techniques, critic the procedure if there are ways to improve, and to eat a delicious food. Rules are simple, we will choose one recipe and send it out to the group by 16th of every month and the reveal date will be 15th of the next month . On that day we will blog about it. A linky tool will be open during that time and each member can link their post. First month we are going to do a recipe, 2nd and 3rd month will be a theme and the 4th month we will be back at a recipe. By doing in between recipes, we will able to learn more. 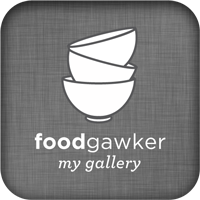 All enthusiastic bloggers interested in baking are welcome, please email me at favoriterecipes12@gmail.com. We will appreciate the use of logo or worded link that will help to spread the word. A bunch of thanks to Tina for designing this beautiful logo. If you want to make it a gluten or vegan free diet, you can do those modifications also. Have you ever combined potato,mushroom and bellpeppers together in your dry curries?, if not you guys have to give a try to this ultimate combo.An excellent side dish to enjoy either with a bowl of rice or rotis.I simply spiced this fantastic quick curry with freshly grounded pepper powder and coriander powder. Serve this fingerlicking curry along with curd or rasam rice, both tastes absolutely divine and everyone at home simply enjoyed it.This curry will hardly take 15minutes to gets ready, i even served this peppered curry along with chappathis for our dinner.This is my 3rd entry for this week's blogging marathon,do check out the other bloggers running along with me here. Heat enough oil in a pan, throw the cumin seeds and curry leaves and fry, now add the chopped onions and cook for few minutes. Add the chopped mushrooms,cubed potatoes and salt,cook for few seconds, finally add the cubed bellpepper, coriander powder, cook everything in simmer for few more minutes. Springle some water and cook everything in simmer until the veggies gets well cooked, add the pepper powder finally and cook everything for few more seconds. Put off the stove and serve hot as side dish. 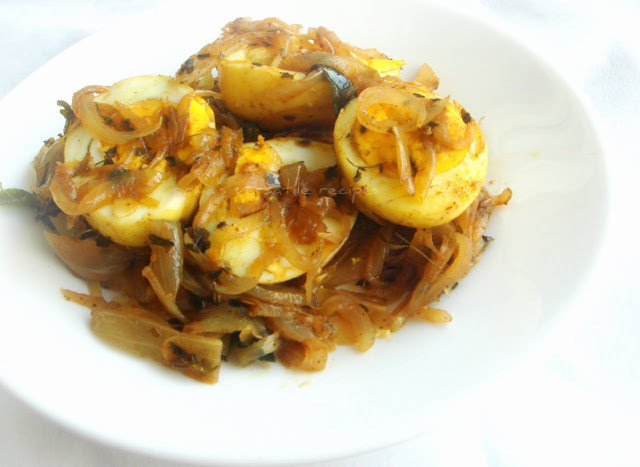 My second dry saute post for this week's blogging marathon is this easy breezy egg onion roast, with loads of onions,garam masala and chilly powder, this egg roast goes awesome as side dish with sambar rice or rasam rice. 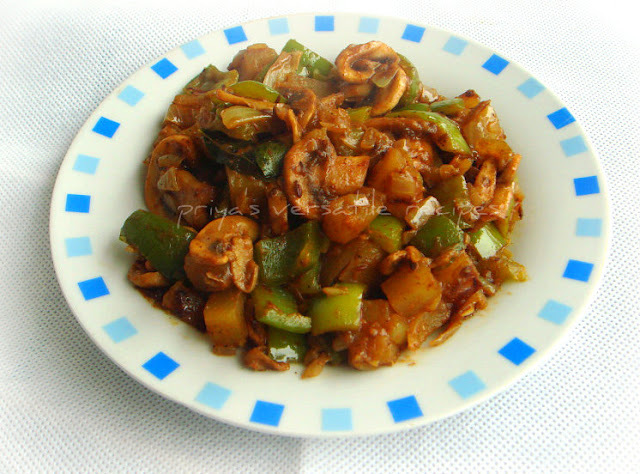 Quite an easy side dish, its gets ready quickly and you can serve it even with rotis. I simply added few kasuri methi leaves to gives a wonderful flavour to this easy egg roast.You can add even veggies to this onion roast to make this egg roast more colourful.Check out the other bloggers running this blogging marathon here. Heat enough oil, throw the fennel seeds and fry until they turns brown, add immediately the onions and salt,cook until they turns transculent. Add immediately the kasuri methi,curry leaves,garam masala powder,chilly powder, cook for few more minutes in simmer until the onions gets well cooked..
Now add the hard boiled eggs and toss it gently with the cooked spiced onions. This week is our last week of blogging marathon for this month, i choosed dry sautes after cooking up different dishes with many interesting theme for the past last three weeks, so this week's blogging marathon is going to be interesting dry sautes.Check out the other marathoners running this month's blogging marathon here. 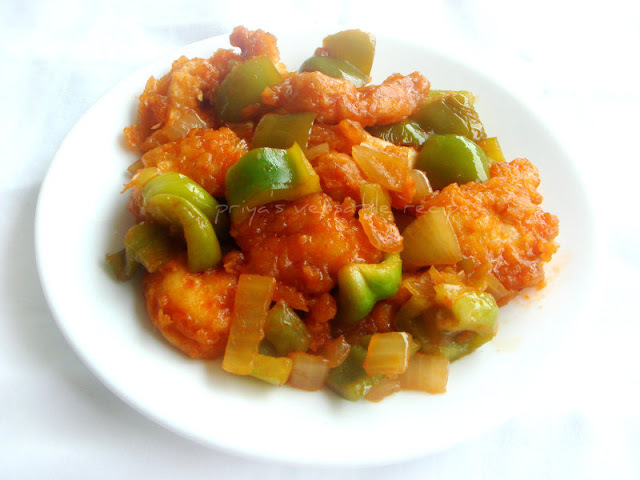 While going through my recipe index few days back, i noticed that i havent posted yet our family favourite Indo chinese dish manchurian with paneer.This manchurian tastes absolutely delicious,yummy and a tasty side dish to enjoy thoroughly with a bowl of fried rice.If you are bored of usual stir fries or gravies prepared with paneer, this yummy manchurian will definitely satisfy your tastebuds.Sending to Celebrate-Olympic Games guest hosted by me and to Dish It Out-Paneer/Tofu & Bellpepper guest hosted by Usha,event by Vardhini. In a large bowl, combine all purpose flour, cornflour, salt, garlic-ginger paste and the green chili paste.Mix well with water to get a thick batter. Heat oil in a pan.Dip the cubed paneer in the batter,drop gently to the hot oil and fry in oil. Drain the excess of oil and keep aside. In a flat pan, add some oil and when it smokes add the chopped onions and capsicum and saute for few seconds.Now add the chopped garlic,salt and fry for a minute. Add the soy sauce and vinegar,stir for a minute. Reduce the heat and then add the cornflour-water. The mixture will start to thicken, keep on stirring on low heat and when the mixture turns semi thick add the tomato ketchup and then add fried paneers. Stir continuously for a couple of minute when it becomes soft, take it out from fire. Garnish with chopped spring onions if needed. Serve hot with noodle or fried rice or as appetizier..
Dunno wat happened to sun god here, he is showing his head very rarely and the climate is super nasty here in Paris, two days back its raining like anything and today its suddenly too hot.People who went for summer vacation to the north part of France says that they spend a chilled summer vacation as its raining there so much frequently. I prepared this tofu mixed veggies samosa for our evening snacks two days back, while it raining outside like anything as everyone at home love to enjoy deep fried foods when the weather is too down.I tried a quick and easy filling with cubed extra firm tofu and mixed veggies like carrot,potato and bellpepper,spiced with usual spice powders. These crispy samosas tastes simply awesome when served with a cup of hot coffee.My kids enjoyed these beauties with ketchup and they just loved it.Sending to Celebrate-Olympic Games guest hosted by me and to Vardhini's Dish it Out-Paneer/Tofu & Bellpeppers guest hosted by Usha. Knead everything with enough water as a smooth and soft dough, keep aside closed with a damp cloth for an hour..
Heat enough oil,let crack the cumin seeds, add immediately the chopped onions, curry leaves, sauté until the onions turns transculent. Add the veggies,cubed tofu,cook for few minutes,finally add red chilly powder, garam masala powder and salt, sauté everything for few minutes. Springle some water, cook everything in simmer until the masala turns thick and veggies gets well cooked,put off the stove and let them get cool completely..
Make tiny balls from the dough, dust with flour and roll them as circles, cut in the middle of the circles, make two demi cricles, just fold the sides to make a cone. Now gently put some already prepared masala inside the cone, press the sides tightly until they gets sticks. Continue the process until the masala and dough get finished, u can get almost 15-20numbers of this samosas..Also u can stick the edges by using a simple flour and water paste..
Heat enough oil for deepfrying, gently drop the samosas, fry until they turns golden brown. Enjoy with ketchup or with a cup of tea or coffee.. 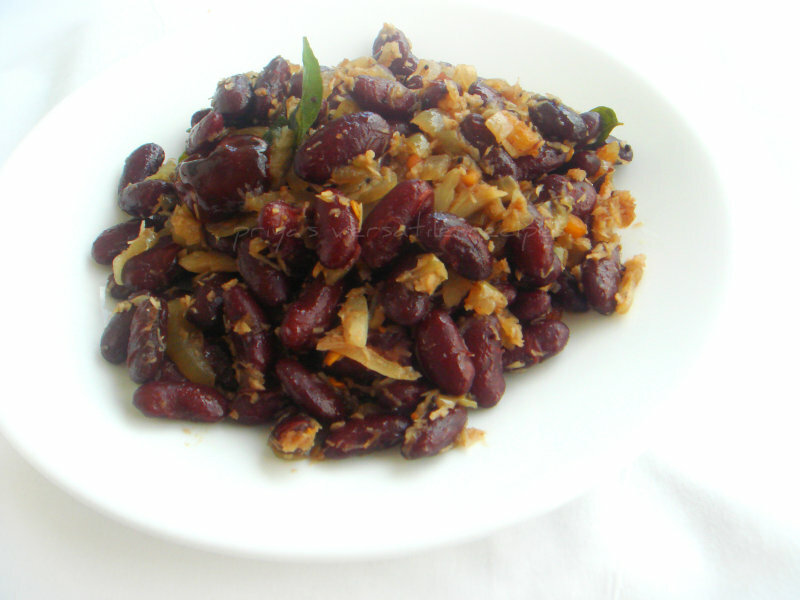 If you want to feed everyone at home easily with nutritious rich rajma, just give a try this quick,easy breezy stirfry prepared simply with cooked rajma and coconut.This stir fry goes awesome as side dish with a hot piping rasam or a simple curd rice. You can also add any veggies like broccoli,carrot to this stir fry to make it more colourful and healthy, best way to sneak this protein rich legumes once in a week in our daily menu.Sending to my own event CWS-Rajma guest hosted by Riddhima and Julie's EP Series - Fenugreek & Chillies hosted by Kaveri. Heat enough oil in a pan, let splutters the mustard seeds and urad dal, add the curry leaves and chopped green chillies,cook for few minutes. Now add the chopped onions, saute until the onions turns transculent. Add the already cooked rajma,salt and coriander powder to the onions,cook everything for few minutes. Finally add the coconut and cook for few minutes. Serve hot as side dish with rice. Whenever i get bored of our usual rava upma, i wont even hesitate a minute to make rava khichadi with roasted rava along with plenty of veggies. Some may call this khichadi as khaarabath, for a change this time, i quickly and simply prepared this wonderful looking cornmeal khichadi for our yesterday dinner. 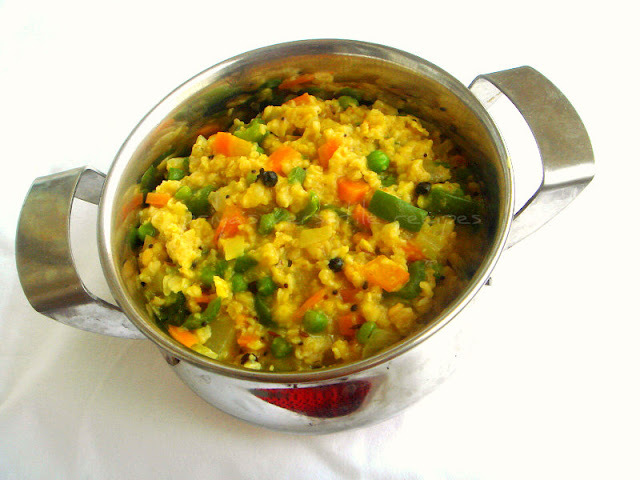 You can add any sort of veggies to make this delicious khichadi or else cook just with onions and tomatoes. Serve this colourful khichadi with thick coconut chutney, i can have it anytime. An excellent,quick and easy breezy breakfast or dinner to enjoy without any hesitation.My mom used to make this khichadi with garlic cloves instead of ginger garlic paste and temper it with whole spices like clove,cinnamon stick,bayleaf and fennel seeds instead of usual tempering spices, this will give definitely a fabulous masala flavour to this simple khichadi. Dry roast the yellow cornmeal until they get warm. Heat enough oil,fry the whole spices,fennel seeds until they turns brown. Add the chopped garlic cloves,curryleaves and fry for few seconds, add the chopped onions,chopped tomatoes and cook until the onions turns transculent. Add the mixed veggies immediately,add enough salt,turmeric powder and cook everything until the veggies gets half cooked. Add two cups of water to the cooking veggies, bring to boil. Once the water starts boiling, add the roasted cornmeal to the boiling water, stir continously and cook until everything gets well cooked. Finally add the ghee and put off the stove. Serve hot with coconut chutney. Once summer starts here, lavender shows their head almost in every garden here, i got a bunch of fresh lavender sprigs from my neighbour's garden as she knows that i love lavender very much. 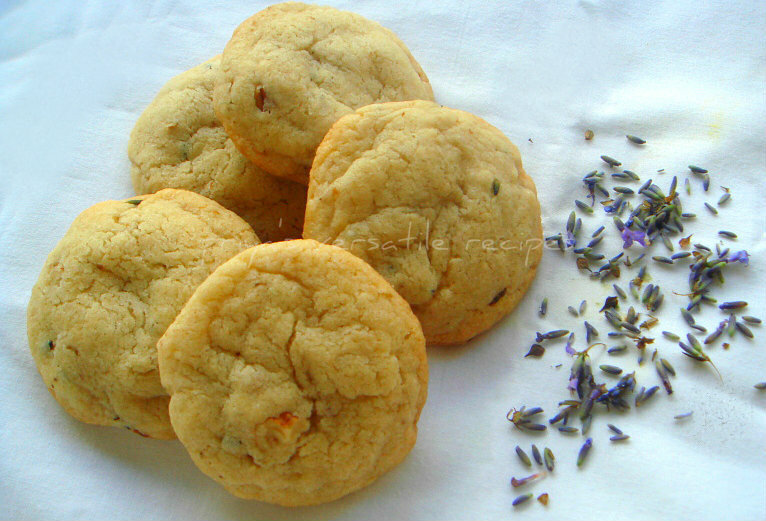 Back home, i used some of those fresh lavender for making these scrumptious cookies along with some chopped walnuts. This is the first time am using lavender in my baking,eventhough baking with lavender was one of my dream since a long. I know very well that my kids may not love this lavender cookies,but myself and H enjoyed a lot with hot masala tea for our snacks, i loved the flavour of lavender in cookies.These cookies are really dangerous and if you dont care about your waist line these cookies are for you.Sending to Swathi's Favourite Recipes-Cookies. Beat the butter until they turns soft, add the sugar to the butter,beat for few minutes,meanwhile siever the flour with baking powder and keep aside. Now add gradually the flour with baking powder,lavender,roughly chopped walnuts,salt and mix well..Springle the milk and turn everything as stif dough. Preheat the oven to 350F, arrange a baking sheet over a baking tray. Make a medium sized balls from the dough,flatten them in your plams and arrange over the lined baking sheet. Bake for 15-20minutes in middle rack until the crust turns slightly brown, keep aside and let them cool. Enjoy with a cup of tea. Have you ever tried baking pakodas? these guilt free pakodas are seriously super crispy and definitely addictive.I have already tried baking my all time favourite onion pakodas whenever i crave for them. But for my last day of blogging marathon, i wanted to make something special and a super nutty pakodas.Cashews i just love them, since i became a health nut am avoiding cashews in my gravies eventhough i came back from India with 4kgs of cashews. 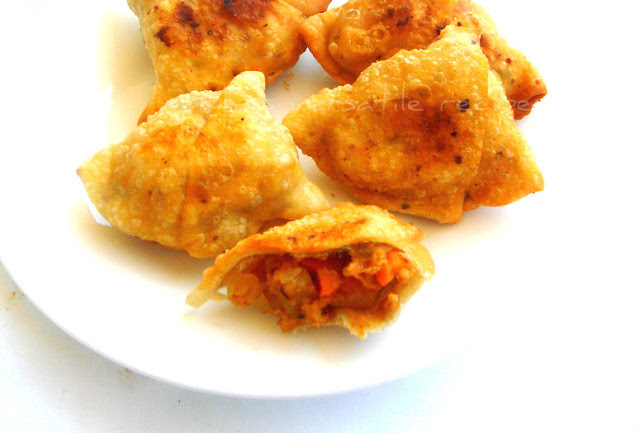 These baked pakodas turned out simply awesome and fantastic. A prefect evening snack to enjoy with a cup of hot masala tea, i just used few drops of oil for baking apart from it,these pakodas are completely oil-less. Do check the other marathoner's running this blogging marathon here. Take the besan flour, rice flour,curryleaves, chopped cashew nuts, chopped onions, crushed fennel seeds,chopped green chillies,baking soda,salt and springle enough water to make a thick paste..
Preheat the oven to 350F,line a greased baking sheet over a baking tray, take medium sized balls from the paste and drop over the lined baking sheet. Bake for 20-25minutes (by turning the pakodas twice in between) until the crust turns golden brown. 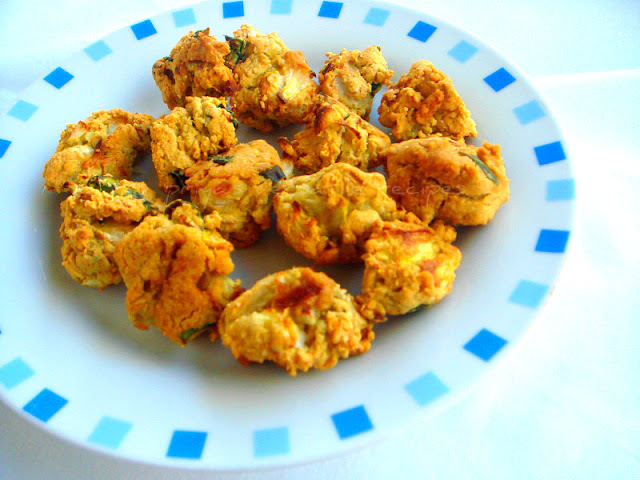 Enjoy these guilt free pakodas with hot coffee or tea. Baking makes me happy,whenever i feel down immediately i get my measurement cups and ingredients to make a simple cake just get rid of it. When i choosed this week's blogging marathon theme as deep fried snacks being healthy by baking or steaming, i know i'll definitely make some vadas with urad dal. Since ever i tried different dishes from black urad dal,i got hooked to this nutritious dal and i couldnt stop myself to use them quite often in my cooking nowadays. Everyone at home dont even ask me why the vadas or temepered dals are black as they know very well that am using these black urad dal instead of deskinned urad dal quite often now. Thank god, even the final result looks dull and dark, the taste was simple awesome and all at home just enjoy anything cooked with this dal now. 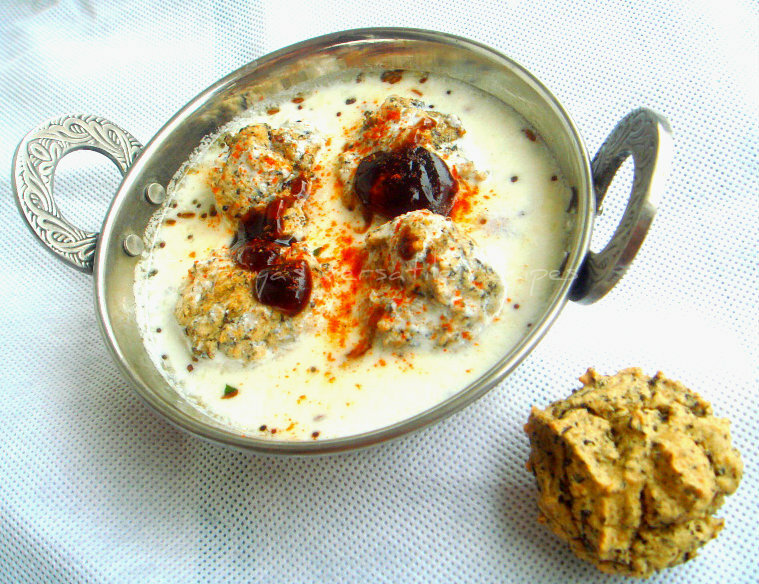 Coming to this baked version of urad dal vada,last week it was too hot here and i went for making this guilt free dahi vadas for our snacks, i quickly prepared a usual batter and used my mini muffins mould to bake them, once they get well baked, i simply soaked them to spiced buttermilk. Omg, they tasted simply awesome, none at home noticed that these vadas are baked, we enjoyed this oil less dahi vadas thoroughly. An another guilt free dish to enjoy without any hesitation, for this month of Fried to Favourites Nupur choosed dahi vada or spring rolls as this month's challenge, obviously as am a part of this challenge am sending this guilt free dahi vadas to her.Do check out the other marathoners running here. Grind the soaked urad dal as fine paste, add the peppercorns,fennel seeds and curry leaves with salt and make as a batter. Preheat the oven to 350F, drop enough batter to the silicon muffin mould and bake for 20-25minutes until a skewer inserted comes out clean. Meanwhile heat the oil, fry the mustard seeds,urad dal,cumin seeds and asafoetida powder, add this tempered spices and enough salt to the beaten yogurt. Add immediately the baked vadas to the tempered yogurt and keep aside. While serving,drizzle enough chutney and springle chilly powder on the top and enjoy. My kids can have pastas even everyday,they just love it with anything and anytime of the day. Farfalle is well known as bow tie pastas and dunno why they love this bow shaped pastas everytime. 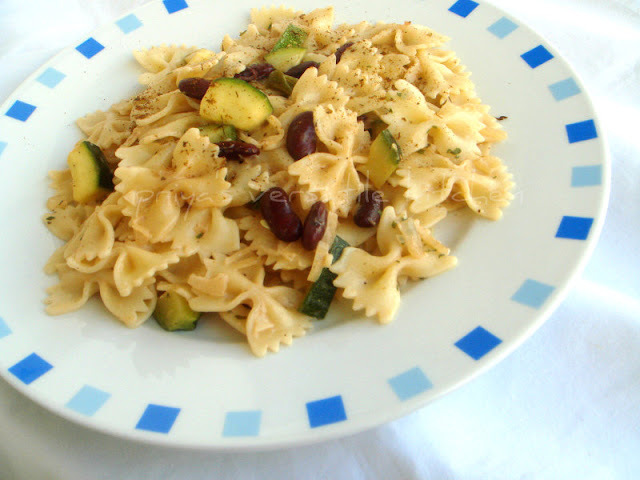 After spaghetti, they just love this pasta,i simply prepared this quick,creamy,healthy farfalle with some cooked kidney beans and cubed zucchini few days back.This dish is super filling, wholesome and definitely satisfying when served along with grilled meats and salad. Quite an easy dish to prepare with simple ingredients and definitely a kid's friendly dish.Sending to my own event CWS-Rajma guest hosted by Riddhima and to Priya's VFAM-Zucchini by Vardhini. Heat olive oil, saute the chopped onions until they turns transculent, add immediately the cubed zucchinis,parsley leavess and cook for few minutes. Add now the pepper powder,cooked rajma,salt,cream and cooked paste,stir for few minutes. Serve hot topped with grated cheese or dry parsley leaves..
Am starting my third week of blogging marathon, as usual i'll be running my three days blogging marathon with an incredible theme, i got hooked to this week's theme immediately,yep i didnt even hesitated a second coz this week's blogging marathon's theme is going to be Deep fried snacks being healthy by baking or steaming. 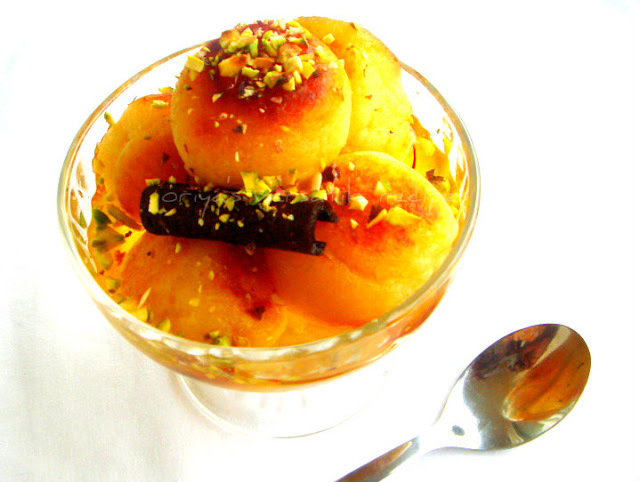 For me sweets, can be also served for snacks and we love specially gulab jamuns for our snacks or for our desserts when served simply with few scoops of icecream. When i choosed this theme, the first thing came to my mind is obviously gulab jamuns, i wanted to make them either by baking or cooking through paniyaram pan. Finally i went for baking, i used store bought gulab jamun mix for making this jamuns easily. Since i dont know the final result i went for making a small batch and the baking time took just 15 minutes for me, meanwhile i prepared my sugar syrup and keep aside to get cool completely.Once they came out of the oven,these jamuns were bit hard but when soaked to the sugar syrup they turned out super soft within few minutes and taste as like the deep fried ones.Give a try friends, you will truly enjoy this zero oil gulab jamun for the sure.Check out the other marathoners running this 18th edition of blogging marathon here. Take the jamun mix in a bowl, gradually add the water and make a soft dough,keep aside for 5minutes. Meanwhile take the sugar with one and half cup of water,bring to boil. Now add the cinnamon stick,cardamom powder and saffron strands,cook fro few minutes,put off the stove and keep aside. Let the sugar syrup gets cool completely.Preheat the oven to 300F. Make tiny balls from the dough, arrange over a baking sheet lined over a baking tray. Bake for 15-20minutes, by turning the baking jamuns twice in between else they will turn dark brown to one side while the other side will stay white. Now soak the baked jamuns to the already prepared sugar syrup. Sprinkle few chopped nuts while serving. I love dal based rotis for my dinner, two days back i quickly prepared this super spongy,easy breezy healthy chappathis with a combination of both cooked yellowsplit moongdal and cooked whole green moongdal.Eventhough the colour of this chappathi was bit dull,tastewise it was absolutely marvellous,super soft and prefect for a nutritious evening dinner. I simply spiced my chappathi with freshly grounded pepper powder and garam masala powder,i simply served this chappathi simply with thick curd and any pickle for our dinner. 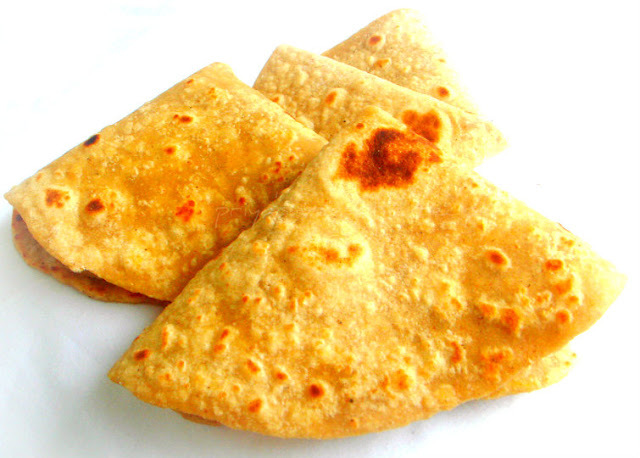 An excellent protein rich rotis to enjoy without any hesitation.These healthy chappathis goes to Kalyani'sMagic Mingle,Ramadan Friendly Recipes by Halal foodie & to my event Healthy Diet-Cooking with Whole grains hosted by Jaya. Take the wheat flour,pepper powder,garam masala powder and salt in a large bowl, meanwhile grind both the moongdal as fine paste. Now add the grounded paste,warm water as per need to the flour, knead everything as soft and stiff dough. Make medium sized balls from the dough and roll as thin circles with a rolling pin. Heat a tawa, drop the rolled chappathis and drizzle oil and cook on both sides until they get well cooked. Serve with thick curd and mango pickle. Indian cuisine have varieties of foods, each and every part of India have their traditional,authentic dishes. Since even i joined Indian Cooking Challenge a monthly event by Srivalli,am learning truly variety of foods from India.We already cooked from many parts of India, for this month's challenge she choosed this addictive,super delicious patishapta, an incredible sweet crepes prepared in Bengal during the festival of sankranti. 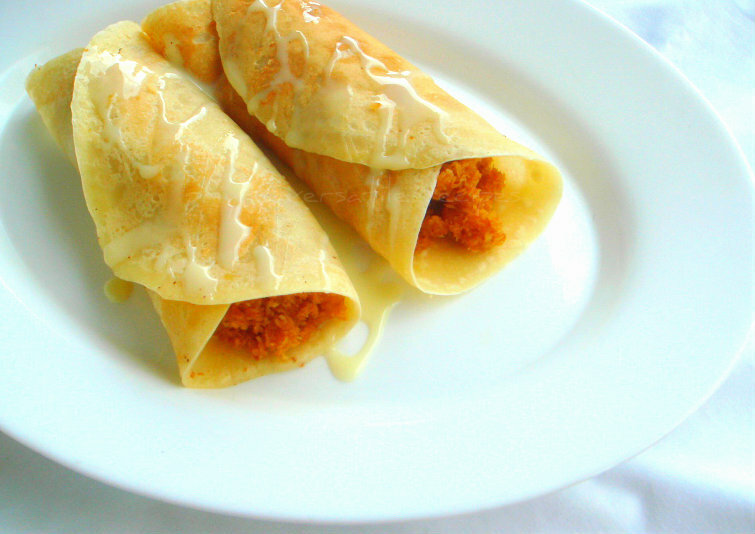 I have already had many varieties of crepes,but this bengali sweet crepe was quite different from the others, the filling used in this crepe goes for a lovely coconut,palmsugar and khoya mixture. These crepes were super soft and with this coconut-khoya filling, these crepes tastes fabulously awesome when we enjoyed this. Usually this crepes are served with sweetened milk but i served them with condensed milk which gives more sweetness to this wonderful sweet crepe, if you are an ardent fan of Bengali sweets like me you will definitely fallen in love with this crepes.Thanks to Sandeepa for sharing this yummy crepes.Sending to Ramadan Friendly Recipes by Halal Foodie. Heat a pan, take the coconut and sugar together,mix it well with a spatula, once the sugar melts add the khoya and cook until the mixture turns thick. Meanwhile mix all the ingredients given for the batter in a bowl and makes a smooth batter. Heat a tawa, pour a ladle of this prepared batter and spread it as round thin circle, if needed drizzle melted butter or ghee. Once it gets cooked, flip it and cook the other side. Place the prepared filling in the middle and bring the edges of the crepe to the center. Serve immediately drizzled with sweetened condensed milk. Its been a long, i posted foods prepared with my favourite grain 'Oats', here is my recent comforting and favourite food i prepared just for our lunch yesterday. Usually i make this type of dal khichdi with rice and dals whenever i feel lazy to cook as it goes for quick and easy breezy preparation. This time i combined veggies, oats together in this dal khichdi and used cooked moongdal instead of toordal or masoor dal.You can simply have this nutritious,filling and colourful khichi with a pickle or else with few fried papads. You can also replace the oats with wheat rava, quinoa or brown rice for preparing the same khichdi if you dont want to prepare them with oats. This nutritious khichdi suits prefectly for breakfast,lunch and for dinner too.As i used moongdal and whole black peppers in this healthy khichdi,am sending this wonderful dish to Kalyani's Magic Mingle,Ramadan Friendly Recipes by Halal Foodie and to my own event Healthy Diet-Cooking with Whole grains guest hosted by Jaya. Heat enough oil, fry the mustard seeds,cumin seeds and bay leaves, add immediately the chopped onions,slit opened green chillies,grated ginger,curryleaves and chopped garlic, cook until the onions turns transculent. Now add the mixed veggies,whole black peppers, turmeric powder and salt,cook for few seconds, add two cups of water,cooked moongdal and bring to boil. Meanwhile dry roast the rolled oats and keep aside. Add the roasted oats to the boiling water,stir well and cook for few minutes, put off the stove and dont disturn for few seconds. Serve hot with pickles or papads. Its been many years, i stopped running behind the eggs for making my bakes,breads or cakes.After coming to this wonderful virtual world,i can cook or bake up anything as eggless or vegan version now with egg substitutes. Since ever i started making these eggless versions bakes or cakes quite often, none at home wont ever ask me whether its eggless or vegan, they just dont found out the difference between the bakes prepared with eggs or without and enjoy them thoroughly.For our last sunday brunch i quickly prepared some pancakes with flaxmeal,banana puree and whole wheat flour with some chocolate chips in it as i started craving for pancakes. An incredible,super filling pancakes to enjoy without any hesitation for a lazy sunday brunch, just serve this pancakes warm with maple syrup or honey, am damn sure you will definitely have a satisfying brunch. You can make this pancakes even for your kid's evening snacks and can serve them very well with nutella spread. Sending this healthy pancakes to my own event Healthy Diet-Cooking With Wholegrains guest hosted by Jaya and Ramadan Friendly Recipes by Halal foodie. 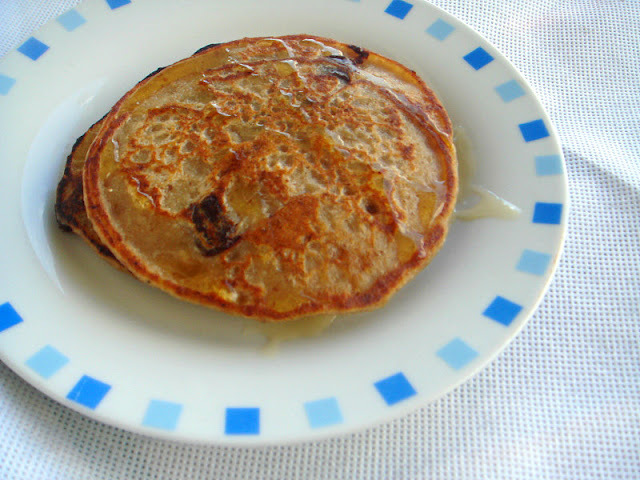 Heat a nonstick pan,pour a ladle of this pancake batter and cook on both sides until they turns brown.. Serve warm along with maple syrup or honey. I had some leftover store bought tortillas sitting since a long in my pantry, also their expiry date was not that much far away. Its quite an obligation for me to finish them as i dont like to trash anything that much easily. When i planned to finish them as quesadillas,the famous mexican savoury sandwich prepared usually with a stuffing and cheese, everyone at home said 'OK'. Since i had some cooked rajma aka kidney beans in my fridge,i simply combined them with green bellpeppers to make a quick and easy breezy filling for making this quesadillas. I simply mashed the rajma beans and cooked with bellpepper, sauteed onions later i spiced quickly with red chilly flakes,thymn leaves,salt and ketchup. The stuffing tastes simply awesome and when i served as quesadillas, everyone at home simply enjoyed having this nutritious and super cheesy quesadillas with a simple tomato salad for their dinner. Heat oil, saute the onions until they turns transculent, add the chopped bellpepper and cooked mashed rajma, cook everything in high flame for few minutes. Add the red chilly flakes,ketchup and salt,cook for few seconds and put off the stove..
Heat a pan in simmer,drop a flour tortillas to the hot pan, gently spread the cooked bean topped with cheese generously. Top the another tortilla over the cheese,press it with a spatula and cook for few seconds, flip the tortillas to toast the other side. Once the quesadillas get well toasted, transfer to a plate and cut as a 4 or 6 wedges..
Green tomato and moongdal curry is a kind mild gravy gets ready very easily which ressembles quite like Palakad famous molagooshyam. Usually this molagooshyam gravy is prepared by adding few veggies like ashgourd, raw bananas and yam, but for a change i used green tomatoes aka pacha thakkali for making molagooshyam style of moongdal curry. Actually i got an opportunity to pluck fresh green tomatoes from our last visit to farm house, back home i prepared the day itself this mild gravy with yellow split moongdal to serve along with hot steaming idlis. You can serve this quick,delicious and nutritious curry even with rice also you can use carrots,beans,peas like veggies to give more colour to this curry.We prefered this dish prepared with tangy green tomatoes, this recipe suits prefectly for diet conscious peoples, protein rich curry with less oil. Serve this dal based curry with lemon pickle and rice, am damn sure you will have an excellent lunch.Sending this comforting curry to Kalyani'sMagic Mingle and to Ramadan Friendly Recipes by Halal Foodie. Dry roast the yellow split moongdal until they turns golden brown, take it in pressure cooker with chopped green tomatoes,turmeric powder and pepper powder with enough water. Pressure cook for 3 hisses and put off the stove. Lightly mash the cooked gravy and add water if needed to adjust the consistency of the curry, meanwhile heat the coconut oil,let splutters the mustard seeds, dry chillies and cumin seeds. Add immediately the tempered spices to the curry and serve hot with rice or idlis or dosas. 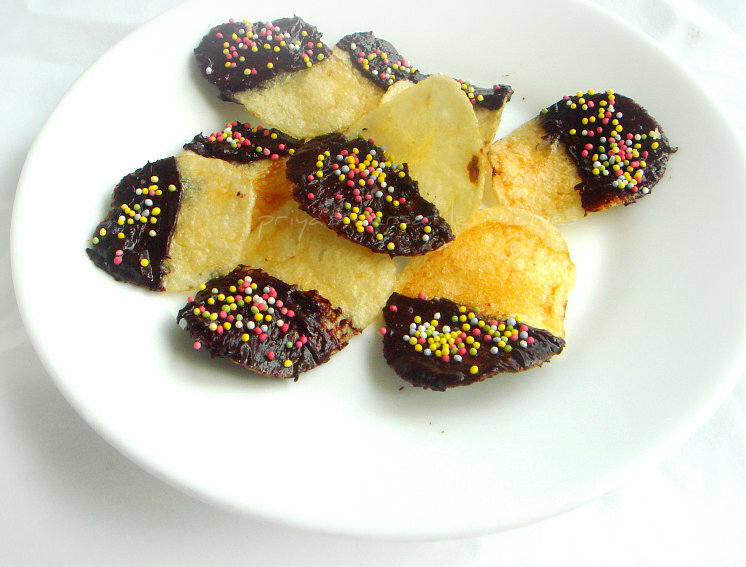 I have seen rarely kids saying no to potato chips,recently i crossed this chocolate dipped potato chips in an organic store here.As most of the kids, even my teddies love to munch a packet of potato chips within few minutes eventhough i'll give them rarely to munch chips for their snacks. These chocolate dipped chips are pretty good,highly addictive and definitely a quick snack.Their flavour is salty-sweet and obviously these chips do retain their crunchiness. These addictive chocolate dipped potato chips suits super prefect for a party menu, definitely a kid's pleaser.You can make a huge batch of this chocolate dipped potato chips within few minutes.Even a kid can make this quick snack easily with an adult help.Check out the other bloggers running this blogging marathon here.Sending to Kid's Delight-Evening Snacks and Ramadan Friendly Recipes by Halal Foodie. Line a baking sheet over a baking tray. Meanwhile melt the chocolate chips,cream,confectioner's sugar together in microwave oven for a minute,stir until its turns smooth. Dip each chip into the melted chocolate and lay on the baking sheet,sprinkle the sugar pearls as per need. Cool in fridge until hardened and munch it. Gojju is a kind of curry prepared in most of the Kannadiga's home, they prepare variety of gojju with any kind of veggies.One among those gojju is pineapple gojju, this gojju have its important place in wedding lunch. Its quite a dream for me to prepare this authentic dish from Karnataka. When Radhika paired me for this month's Bloghop Wednesdays with Nagashree of Sattvaa, immediately i got hooked to her pineapple gojju eventhough she have numerous dishes i wanted to give a try. Thanks to Nagashree for sharing this fingerlicking gojju, oh boy even my teddies loved it. I was surprised and shocked when i saw when they started relishing this gojju with their rotis.This gojju came out super creamy and fabulously delicious with wonderful flavours in it. This gojju goes for a simple preparation, with less ingredients and gets ready very much easily and quickly. If you like your curry mildly spicy,sweet and sour, this pineapple gojju is for you.Sending to Celebrate-Olympic Games guest hosted by me & to Ramadan Friendly Recipes. Heat oil in a pan, roast all the ingredients given under the list 'to roast' until a nice aroma comes out,keep aside and let them cool completely. Now grind the roasted spices and coconut together with enough water as smooth paste. Heat enough oil in a kadai, fry the curry leaves and grounded masala for few seconds, add enough water to adjust the consistency of the gojju, now add the jaggery,salt and bring it to boil. Finally add the pineapple pieces and let it boil for few minutes, put off the stove.Let this gojju stand for an hour before serving. Serve this gojju with rotis or rice. My lil one's long request is waffles, am keeping myself away from all these stuffs as my teddies love them with loads of nutella spread. But my son was pestering me since a long, finally i prepared a vegan,multigrain waffles with their favourite nesquik, chocolate powder for making this waffles.I quickly prepared a waffle batter with wholewheat flour,ragi flour,soyaflour,grounded oats,all purpose flour with flax seed meal,honey,chocolate powder and soya milk. Served this healthy waffles with a quick chocolate sauce without any cream or milk. My teddies just enjoyed having this super healthy and addictive waffles for their snacks, even my H never liked having waffles loved this multigrain waffles with chocolate sauce drizzled over it.This is my second entry for this week's blogging marathon as these waffles suits prefectly to the theme i choosed for this week.Check out the other marathoners running this 18th edition of blogging marathon here.Sending to Kid's Delight-Evening Snacks guest hosted by Vardhini, event by Srivalli , Healthy Diet-Cooking with wholegrains guest hosted by Jaya and to Celebrate-Olympic Games . In a large bowl, take the whole wheat flour,soya flour,ragi flour,all purpose flour,grounded oats, flax seed meal,baking powder,baking soda and chocolate powder. Mix well. In an another bowl, take the honey,soya milk, vanilla extract, mix everything well. Gradually add the dry ingredients to the wet ingredients and make a thick batter, pour a ladle of this batter to the preheated waffle maker and cook until they get well cooked. Take the chocolate chips and water in a bowl, heat in microwave oven for 2-3minutes, mix well the melted chocolate as a thick sauce. While serving the waffle,just drizzle the prepared chocolate sauce over the waffle and enjoy. Am really enjoying preparing foods with fresh veggies we plucked from a farmhouse, my Fb friends would have already seen the pictures i posted. Sometimes i am not sure wat to cook with them, my teddies plucked almost 3 kgs of zucchinis and back home am trying to make cakes,soups and omelettes with them for our dinner. My H asked me to cook those zucchinis something spicy as he got bored of them already. A kootu or a poriyal,finally i went for making this super delicious poricha kootu. The aroma of this kootu was simply fabulous and we had this kootu with rice for our lunch and with crispy dosas for our dinner.The highlight of this kootu is the masala paste prepared specially for this poricha kootu. Without this masala, this kootu will tastes exactly as a dal. Heat few drops of oil, roast the spices given under list 'to grind' one by one until they turns brown, let it cool and grind as smooth paste with enough water and keep aside. Meanwhile take the moongdal,asafoetida powder, turmeric powder together in a pressure cooker with enough water, cook upto 3hisses. Heat enough oil in a kadai, let splutters the mustard seeds, cumin seeds, add immediately both chopped onions and chopped tomatoes with salt, cook until the veggies get well cooked. Now add the cubed zucchinis to it, cook in simmer until the veggies gets half cooked. Add now the already prepared grounded paste, cooked dal to the veggies. Bring to boil, put in simmer and cook until the veggies gets well cooked. Serve with rice, idlis or dosas. This kootu works out wonder even with pongal. Am running my second week of blogging marathon for the next three days, i choosed kid's delight-evening snacks as this week's theme. For the next two days, i'll be posting snacks which suits prefectly for kids. Even its school days or summer vacation, snacks have their importance in our daily menu. I do variety of snacks eventhough sometimes my teddies love to have junk foods for their evening snacks. 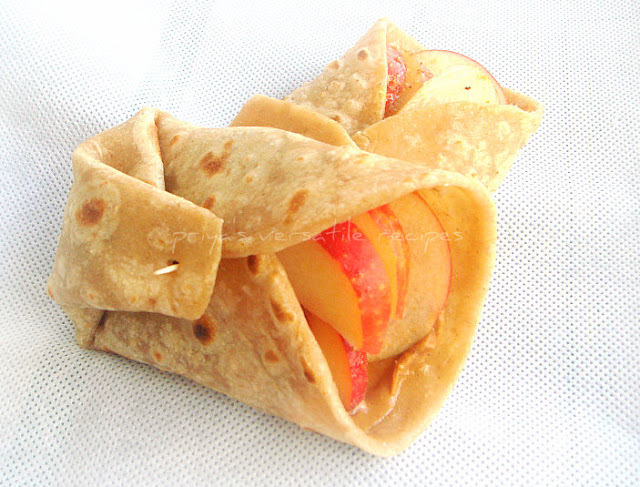 Fortunately, my teddies are just like me, they devour anything with peanut butter.For our weekend picnic, i prepared this quick,healthy chapathi wrap with honey,peanut butter and sliced apple for our snacks. These wraps are super filling,healthy at the same time a wonderful evening snack for kids.You can make the same wrap as sandwich just with bread slices and serve them for snacks.Check out the other bloggers running this 18th edition of blogging marathon here.Sending to my own event Healthy Diet - Healthy Sandwich guest hosted by Kalyani and to Kid's Delight- Evening snacks guest hosted by Vardhini,event by Srivalli. Spread the peanut butter over the chappathi, arrange enough apple slices as you desire, drizzle generously the honey and wrap it tightly. Its summer time here, kids are at home. We are planning to keep them busy just by going out and H will be in vacation only in August. This weekend we had a wonderful saturday, we guys went to a farm house where we can pick and pluck fresh veggies and fruits as we desire. Obviously we went for a picnic and my teddies had a loads of fun. We came back home with fresh zucchinis,tomatoes,beets,beans,strawberries and raspberries and cucumbers to home. I planned to prepare a quick,open faced omelette called frittata with those fresh veggies, but finally i choosed zucchinis and went for making this frittata with finely grated zucchinis for our today's dinner and served simply with a lettuce salad.You doesnt need of onions,butter or oil for making this healthy oven baked frittata. With an adult help,even a kid can prepare this zucchini frittata.Sending to Celebrate-Olympic Games, VFAM-Zucchini guest hosted by Vardhini,event by Priya,Ramadan Friendly Recipes by Halal Foodie, Vardhini's Bake Fest guest hosted by Pradnya..
Preheat the oven to 350F..Take the grated zucchini,cream,beaten eggs,flour,pepper powder and salt together in a bowl and mix with a spatula until they get well mixed. Pour this mixture to a greased round mould, bake this zucchini frittata for 20-25minutes until the crust turns golden brown. Serve with salad or simply with ketchup for kids. Idly upma is usually prepared with leftover or a day before prepared idlies, i make it very rarely and whenever i prepare idly,i'll definitely keep aside few idlies just to make idly upma with it specially for me. This time i prepared this usual idly upma with pepper powder and cooked split yellow moongdal to give a nutritious twist. They turned out simply awesome and delicious. 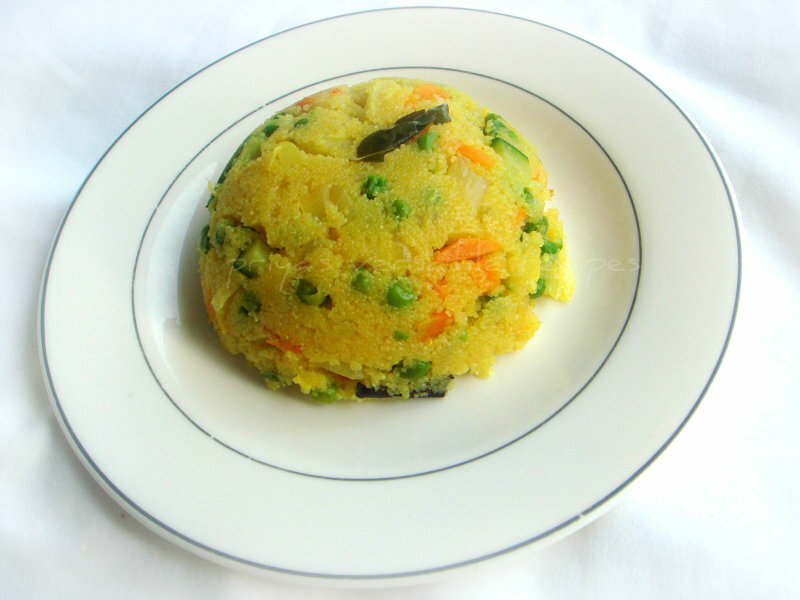 This idly upma gets ready in less time eventhough you need to soak the yellow moongdal and cook it aside. Dont forget to make this peppered idly upma next time if you want to give a twist to usual idli upma, am sending this dish to Kalyani's Magic Mingle. Take the idlis in a mixie jar, give a quick pulse to get a coarse mixture of idli,meanwhile cook the moongdal until they gets partially cooked in a vessel, drain the excess of water and keep aside. Heat enough oil, fry the mustard seeds, channadal,urad dal,curry leaves, asafeotida powder,add immediately the chopped onions,slit opened green chillies and curry leaves, saute until the onions turns transculent..
Now add the pulsed idlis,cooked moongdal,pepper powder,turmeric powder and salt, cook everything simmer for few minutes, serve warm. Am so happy to see loads of interesting and lovely entries for this MEC event i hosted for the month of June. I have to say big thanks to Srivalli of Cooking 4 All Seasons for givine me a wonderful chance to host this lovely event. 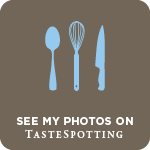 A very big thanks to all my dear food bloggers who participated enthusiastically and made this event a huge success. People who reheat the dishes or heat milk usually through microwave oven,dont have any excuse anymore after seeing this roundup with so many delicious dishes cooked through microwave oven. Dont forget to bookmark this page for further use friends. Most of our lunch will definitely have hot piping rasam, as i told earlier we are rasam family. I have already prepared many varieties of rasam and this super fingerlicking pepper moongdal rasam is one among those comforting food. Instead of using rasam powder, i went for a special masala using peppercorns,cumin seeds, corainder seeds,dry red chillies and channa dal for making this rasam, we call this rasam usually as arachi vitta rasam. Also i used cooked moongdal for preparing rasam instead of usual toordal, serve this rasam simply with fried papads and chicken fry, you will definitely enjoy this spicy rasam.This is my second entry to Kalyani's Magic Mingle. Dry roast all the spices given under list 'to grind' for few minutes and grind as fine paste with enough water. Meanwhile take the cooked dal,crushed tomatoes,grounded paste,crushed garlic cloves and salt in a bowl, add enough water and keep aside. Heat ghee, let splutters the mustard seeds,cumin seeds and add the slit opened green chillies,curry leaves, dry red chilly, asafoetida powder and fry for few minutes. Now add the already prepared dal-grounded paste mixture to the tempered spices and cook until the rasam starts bubbling, finally add the lemon juice and put off the stove. We are all in holiday mood,obviously i dont want to spend more time in my kitchen.For our sunday lunch,i went for a super quick,flavourful and delicious one pot meal with already cooked rajma,cubed paneer along with frozen green peas spiced up with pav bhaji masala powder and garam masala powder.Serve this delicious pulao simply with spicy potato fry or hard boiled egg, you guys will definitely have a super filling lunch.If you want to prepare this pulao more colourful and even more nutritious, you can definitely add more veggies or soya chunks to this quick and easy breezy pulao.We had a wonderful,super filling lunch and everyone at home simply enjoyed having this pulao.Sending to CWS-Rajma guest hosted by Riddhima,event by me and to Show Me Your Hits-Lentils hosted by Nalini,event by Sangee and finally to Celebrate-Olympic Games guest hosted by me. Heat enough oil, fry the cumin seeds,cashew nuts until they turns brown, add immediately the chopped onions,saute until the onions turns transculent, add the ginger garlic paste to the veggies, cook until the raw smell goes on. Add the frozen peas,cooked rajma,cubed paneer, pav bhaji masala,garam masala powder and salt, saute for few minutes, add some water and cook until the water gets evaporated. Now add the cooked rice, salt, lemon juice and toss everything gently until everything get well mixed in high heat..put off the stove immediately.. Serve with fried potatoes or eggs..
Every South Indian home will definitely prepare khara pongal atleast once a week, pongal is prepared always with rice and moongdal, later we usually spice them with peppercorns,curryleaves,cumin seeds and cashew nuts fried in ghee or oil. Yesterday i felt very lazy to cook and prepared this easy breezy quinoa based khara pongal for our dinner. Obviously it takes very less time to get ready if you prepare them in pressure cooker. Khara pongal with quinoa turned out absolutely incredible and everyone at home truly enjoyed this nutritious and super filling semi solid dish. Give a twist to the usual rice and dal based pongal with quinoa,am damn sure you will definitely like this variation.Am sending this yummy pongal to Kalyani's Magic Mingle as she choosed moongdal and pepper as star ingredients for this month. Wash together the quinoa and moongdal together and take in pressure cooker with three cups of water, ginger,asafoetida powder and salt, cook upto 3hisses. Meanwhile heat the ghee or oil, fry the cumin seeds, peppercorns,cashew nuts and curry leaves until they turn brown. Once the pressure is released, add the tempered spices & cashews directly to the pressure cooker, toss them well until everything get well mixed. Serve hot with sambar or coconut chutney. 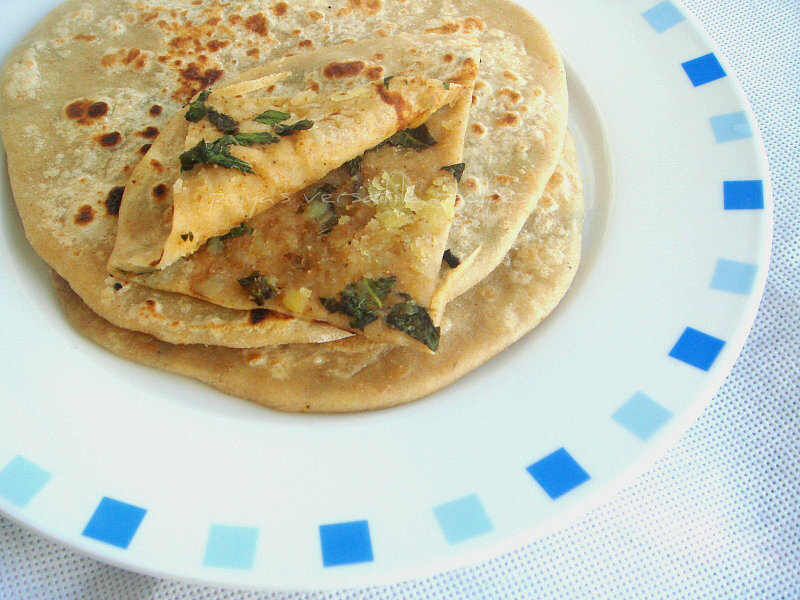 I cant finish this week's blogging marathon without stuffed parathas, i have already posted variety of stuffed parathas. Eventhough our family favourite always goes to aloo parathas, to give a change to this usual aloo parathas, i prepared a quick and easy breezy stuffing with chopped mint leaves,cooked and mashed potatoes and simply spiced this filling with amchur powder,chopped green chillies and garam masala powder. If you want to add onions or any other veggies, you can use them just by grating or sauting them. Coming to this mint aloo paratha, they doesnt even need any side dish to enjoy, the filling itself have both spicy and sour taste and you can have it simply with a thick curd. We just loved this super flavourful aloo parathas for our dinner few days back.Check the marathoners running this month's blogging marathon here.Sending to Celebrate - Olympic Games guest hosted by me,event by Jagruti and to Jagruti's Know Your Flour. Take the wheat flour,oil and salt together in a bowl,add the warm water and knead everything as a stiff and smooth dough,keep aside for half an hour..
Take the cooked and mashed potatoes,chopped mint leaves,chopped green chillies,garam masala powder,amchur powder and salt, mix everything well and keep aside..
Make medium sized balls from the dough, flatten them as small circles with the rolling pin, drop enough aloo masala and cover the masala by sealing the edges of the flatten dough. Dust with flour and roll them gently as parathas..Heat a tawa, drop this flattened mint aloo paratha over the hot tawa, drizzle few drops of oil and cook until they get well cooked..
Poli with sweetened channadal filling is always our family favourite, when i choosed stuffed dishes for this week's blogging marathon, i wanted to make some usual poli. As i posted already our family favourite polis in my space, i wanted to make them different with a wonderful healthy carrot stuffing. I went for a quick, healthy and yummy carrot halwa for making these wonderful looking stuffed carrot sweet polis. These polis are simply awesome with a wonderful carrot halwa stuffing. My teddies simply loved it and enjoyed very much while having this polis when they were still warm. Finely grated carrots with condensed milk and sugar flavoured with cardamom powder gets ready very much easily.A wonderful healthy twist to the usual channadal polis. Heat the ghee, fry the finely grated carrots until they gets half cooked, add the sugar and condensed milk,cook everything together in medium high flame. Add the cardamom powder to the cooking halwa and put off the stove once the halwa gets thickens.Keep aside and let them cool. Knead the maida and salt with enough water as a soft and stiff dough, add the oil and knead again the dough for few more minutes,keep aside with a wet towl for few minutes. Roll out golf sized medium sized balls from the dough..Grease a plastic sheet, roll the dough and place the enough carrot halwa,wrap the dough around the halwa,roll it as a round pancakes..
Heat few drops of oil or ghee, drop gently the rolled polis and cook on both sides until they get well cooked..Enjoy warm. Here we start again blogging marathon, and as usual i'll be running four weeks of blogging marathon with super interesting themes for this whole month. For this first week of blogging marathon, i choosed immediately stuffed dishes as theme once Srivalli announced the theme, i usually make variety of stuffed foods especially with veggies to feed easily my teddies. Personally i love stuffed foods and my family too. My teddies love sweet paniyarams, i do them quite often using kuzhi paniyaram pan. 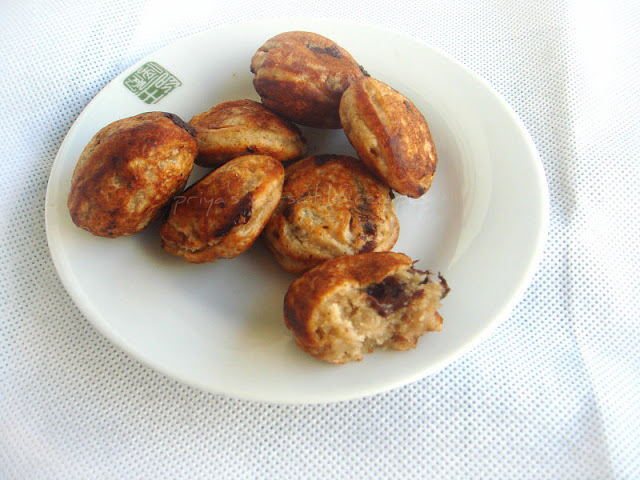 But this time, while preparing these healthy paniyarams with banana and whole wheat flour, i simply used nutella spread to stuff them to give a twist to usual banana paniyarams. Oh boy, this dumplings are super addictive, definitely healthy and a wonderful snacks to enjoy without any hesitation.Dont worry if you dont have this most wanted kuzhi paniyaram pan, you can go for deep frying this paniyarams also you can use chocolate chips instead of nutella, i skipped adding baking powder in this paniyaram.You can add baking powder very well to make your paniyarams more spongy and fluffy.Give a try friends, am damn sure everyone at home will definitely love this super attractive and addictive stuffed healthy paniyarams.Check the marathoners running this month's blogging marathon here.Sending to Jagruti's Know Your Flour,Kid's Delight- Evening snacks guest hosted by Vardhini,event by Srivalli..
Take the wholewheat flour,cardamom powder, salt,banana puree,honey together in a bowl,add enough water or milk to make a thick batter. Heat the paniyaram pan, pour few drops of oil to the pan. Drop gently the prepared batter with a tablespoon, now gently drop a small quantity of nutella, cover it now with enough batter. Cook in medium flame until they get well cooked on both sides, enjoy warm. Its holiday time here and kids are at home. Obviously am very busy with them, since kids are at home, its quite an obligation for me to make different snacks to satisfy my kids tastebuds with healthy stuffs in it. 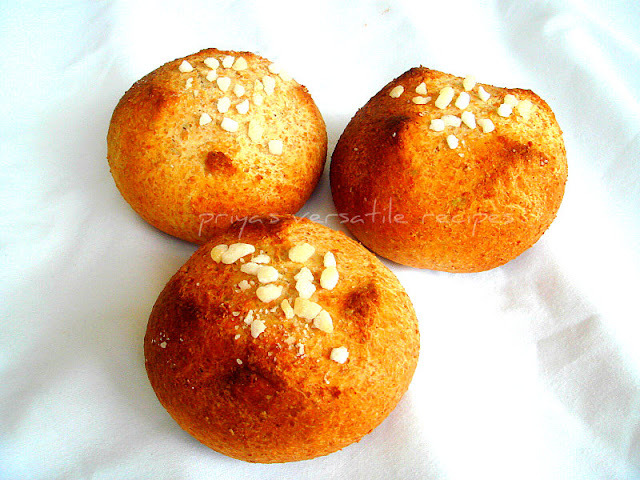 Two days back, i quickly prepared some yeasted buns with whole wheat, wheat bran and all purpose flour with sugar pearls specially for their evening snacks. These buns turned out simply awesome, while serving with nutella spread or simply with any fruit jam, these buns were quite addictive. Everyone at home enjoyed it thoroughly and i was happy when these buns vanished very much quickly.Sending to Mireille's Taste of Tropic- Sugarcane and to Jagruti's Know Your Flour. Take the flours,wheat bran,milk powder,confectioner's sugar,sugar pearls (keep aside few for topping) and butter in a bowl, meanwhile mix the yeast,sugar and salt in half a cup of luke warm water,keep aside for few minutes until the yeast turns foamy..
Add gradually the yeast to the already prepared flour mixture (add water if needed) and knead everything as a soft,smooth dough,keep aside in a warm place for two hours. Preheat the oven to 350F..Once the dough doubled their volume,punch down and knead everything well for few minutes. Make 6-8 medium sized balls from the dough and arrange them over a baking sheet lined over a baking tray. Brush the buns with enough milkand sprinkle generously the sugar pearls,bake for 20-25minutes until the crust turns golden brown.. Enjoy for breakfast or snacks with your favourite spread or jams. Eventhough quiche is loaded with eggs and cheese, its one of our favourite savoury tart and we have it occasionally for our dinner with salads.For this month's Baking Eggless, Gayathri choosed an incredible quiche, initially i wanted to make a quiche with spinach and loads of veggies, somehow finally i went for making the same spinach quiche recipe she choosed. To subsitute the eggs, i went for bechamel sauce,silken tofu with grated emmental cheese. 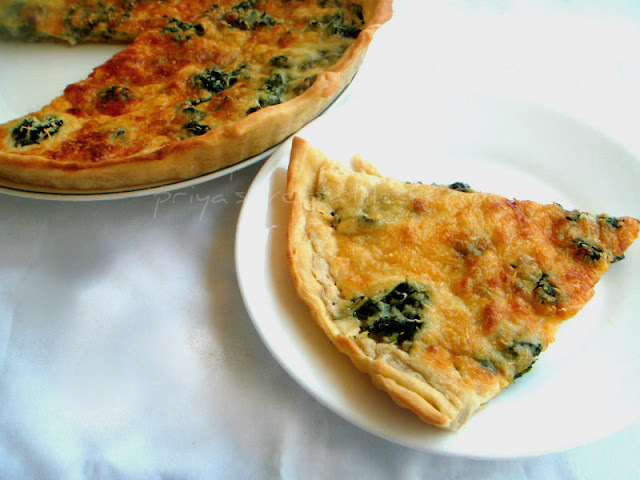 Honestly, this quiche is super cheesy,addictive and definitely eggless to enjoy with a simple lettuce salad. After baking and having few wonderful sweet eggless bakes for this baking eggless challenge, we truly enjoyed this month's challenge of baking this savoury eggless quiche.Thanks to Gayathri for this beautiful challenge, i simply loved this eggless quiche and truly amazed the way they came out super prefect without eggs, coz for me quiche cant be baked without eggs. Sending to Jagruti's COG guest hostes by me. Take the flour in a bowl, add the salt,sugar,butter and olive oil, mix with your fingers to make a crumble like texture. Gradually add the water and make a smooth dough. Wrap it and arrange in fridge for an hour. Heat the butter in a pan in medium heat, once they start melting, add the all purpose flour and cook it for 5 minutes, they should nt change their colour n not to get burned,remove them from fire. Heat the milk with onions,cloves and bayleaves for few minutes, let them sit aside and for more minutes. Remove the onion, cloves, bayleaves from the milk, gradually add the hot milk to the butter flour mixture, stir them contiously..flame should be in simmer. Cook them for few minutes until they turn thick,whisk well and strain the sauce, add salt, pepper powder , nutmeg powder to the sauce. Preheat the oven to 350F, roll the already prepared pie dough as medium thick disc and tranfer it gently to a tart mould,meanwhile heat the oil and saute the chopped spinach until they shrinks a bit. Spread the spinach to the prepared dough,add the emmental cheese,tofu paste to the white sauce,check for salt.Pour this mixture to the already prepared pie dough. Sprinkle generously the emmental cheese on the top and bake for 30-35minutes until the crust turns golden brown. Serve with a simple salad.